Put the grated lemon rind, caster sugar and soft cheese in a bowl and mix well. Roll out the pastry and cut into 3 strips down the long side – approx. 12.5cm each. Then cut these into half lengthways to give you 6 squares. Divide the soft cheese mixture between the squares and spread over them, leaving a 1cm border. Brush this edge with the egg yolk. Divide the blueberries between the squares. 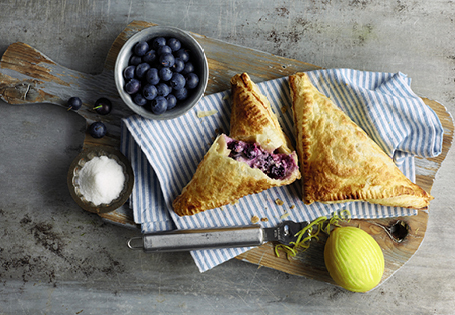 Fold over the pastry to form a triangle and enclose the filling. Use a fork to gently press down the edges. Brush the turnovers with the egg yolk and sprinkle with some caster sugar.